Breathing is not something we typically think about – we just take it for granted. However, it is a finely tuned bodily process that is easily put out of tune when we are in pain or stressed. A normal respiratory rate for an adult is 12-16 breathes per minute. 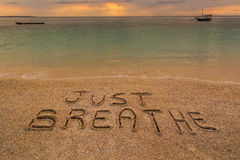 When we are in pain or stressed our respiratory (breathing) rate typically increases (hyperventilation). If for some reason you were to stop breathing i.e. holding your breath, the amount of CO2 in your blood increases and your blood vessel dilate to increase the flow of nutrients to the body. If you hyperventilate, the opposite happens; your blood vessels constrict, inhibiting the transfer of nutrients from the bloodstream. If you chronically hyperventilate, your body will learn to compensate, but it is a fragile balance. Normal breathing no longer feels sufficient, and people often experience anxiety, chest tightness, as well as muscle fatigue and pain. Sit straight without crossing your legs and breathe comfortably and steady. After an exhalation pinch your nose (optional). Hold your breath and time how long you hold your breath. When you feel a slight discomfort, resume your breathing and note the time. Healthy individuals with normal breathing pattern are generally able to hold their breath after exhalation for 40-60 seconds without any discomfort. If your time is between 20-40 seconds you would probably benefit from learning a few simple rules/techniques about how to regain normal breathe control. If your time was below 10 seconds then you should definitely seek advice from a health care practitioner experienced in this area. Watch for other Core Essentials in future posts, so that you can truly live a healthful and active life. Tennis elbow is the common term used to describe pain occurring at the outside bump (lateral epicondyle) of the elbow. The muscles of the forearm that bend the wrist backwards have a common tendon attaching them to the lateral epicondyle. During contraction of the forearm extensors, tension is placed through the extensor tendon at its attachment to the lateral epicondyle. When this tension is excessive straining of the tendon occurs..